WASHINGTON - Foreign Minister Taro Kono asked U.S. Vice President Mike Pence on Friday to lobby President Donald Trump about raising the abduction issue when he meets with North Korean leader Kim Jong Un. Speaking to reporters after speaking with Pence at the White House, Kono said a broad understanding had been reached but declined to elaborate. “We agreed that Japan and the United States will continue to closely cooperate in resolving the abduction issue,” he said of North Korea’s kidnapping of Japanese nationals in the 1970s and 1980s. Kono told Pence that the North’s nuclear and missile ambitions, in addition to the abduction issue, must be resolved comprehensively — a determination that Japan would like reflected both at the first-ever U.S.-North Korea summit scheduled for May and at the inter-Korean summit slated for late April at the truce village of Panmunjom. The United States stands with Japan 100 percent, Pence told Kono, according to a Foreign Ministry official. Kono and Pence affirmed that Tokyo and Washington will maintain “maximum pressure” on Pyongyang to compel Kim to take concrete measures toward the complete, verifiable and irreversible denuclearization of the Korean Peninsula. In a separate meeting at the White House, H.R. McMaster, Trump’s national security adviser, told Kono that the United States will never recognize a nuclear-armed North Korea, the ministry said. McMaster underlined the importance of ensuring close trilateral coordination with Japan and South Korea in addressing the North’s ambitions, it said. Kono also held separate meetings with U.S. Defense Secretary Jim Mattis and Deputy Secretary of State John Sullivan. Kono had initially planned to hold talks with outgoing Secretary of State Rex Tillerson. But with Trump’s dismissal of Tillerson on Tuesday, Kono conferred with Sullivan, who is serving as the acting secretary. Kono and the senior U.S. officials agreed that Prime Minister Shinzo Abe’s scheduled talks with Trump in early April will allow them to coordinate on issues related to North Korea, including the Trump-Kim summit. Aside from North Korea, Kono asked McMaster and Sullivan to exempt Japan from Trump’s controversial decision to impose stiff tariffs on steel and aluminum imports. Friday’s meetings, part of Kono’s three-day trip to Washington ending Saturday, come as Trump agreed last week to meet with Kim. The date and location of the summit have yet to be determined, although neutral countries such as Sweden and Switzerland have been floated as possible hosts. The United States and North Korea have not signed a peace treaty to end the 1950-53 Korean War, which ended in an armistice. The potential summit has raised hopes for a breakthrough on the North Korean nuclear issue. Kim is reportedly committed to denuclearization, but doubts persist as to whether he is serious about giving up the leverage that the North’s nuclear capability provides. During telephone talks Friday, Trump and South Korean President Moon Jae-in agreed that “concrete actions, not words, will be the key to achieving permanent denuclearization of the Korean Peninsula,” according to the White House. While pledging to keep maximum pressure on Pyongyang, Trump and Moon “expressed cautious optimism over recent developments and emphasized that a brighter future is available for North Korea, if it chooses the correct path,” it said. 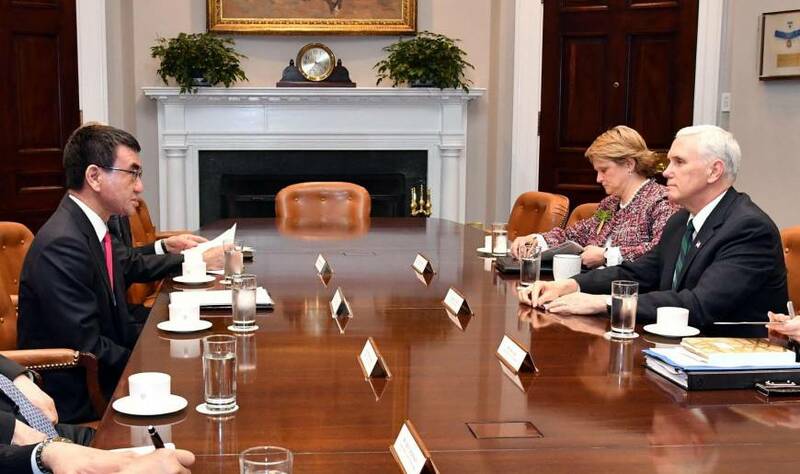 On Saturday, Kono was to meet with South Korean Foreign Minister Kang Kyung-wha in Washington to exchange views on the summit planned between Moon and Kim. Kang is also on a three-day visit to the U.S. capital through Saturday.